One of the things I am most struck by in Paul's letter to the Colossians is his deliberate use of words and phrases to both build up and strengthen the church, and to renounce the false teachings that were trying to influence them. There is a sense throughout the letter that Paul's use of the words faith and faithful are a calling out of the Colossians true identity. In using these terms he both calls them to be who they already are and sets forth various members of their congregation as examples of those who live out the very faithfulness he is calling them to. Words have the power to shape us and inform us; to build up and tear down; to open our eyes to insight and wisdom, and to help us focus on what is important. Words can change us. Holy and faithful. Wouldn't you want to live up to these words if a letter were addressed to you in this manner? Someone who is faithful is trustworthy, loyal, dependable. Someone who is holy has been set apart by God for sacred and godly purposes. Paul says they possess these qualities because they are "in Christ". Their relationship with Christ has made them who they are. They did nothing to earn except remain true to One in whom they placed their faith. He will go on in the letter to connect adjectives to their faith such as stable and steadfast (1:23), firm (2:5), and established (2:7). He reminds them of who they are, building them up with words of identity. 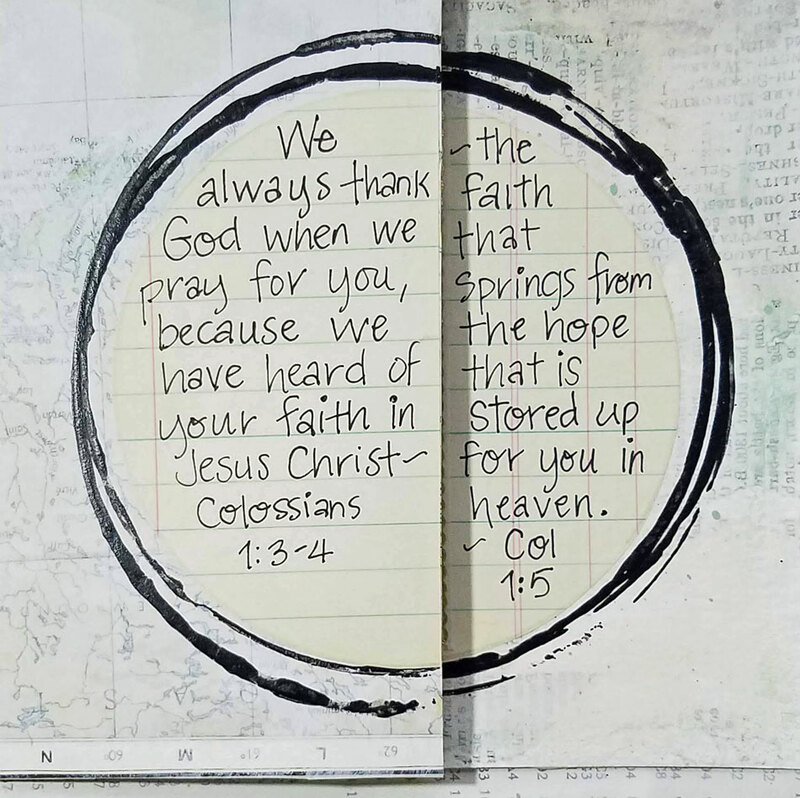 In these verses about the Colossians faith, I was also struck by some of the other words Paul used. First Paul heard about their faith (1:4 and 2:5). He was told that they had come into saving faith through their trust in Jesus Christ, but also implied here is that their faith is visible. It is active; it is seen and known. Their faith is also steadfast and firm because it is based on hope (1:5, 1:23). Their hope is in the gospel, the word of truth, that they heard from those who shared the good news with them. Faith grows when we see active faith in others and when we hear stories of their faith journey and how God has been active in their lives. 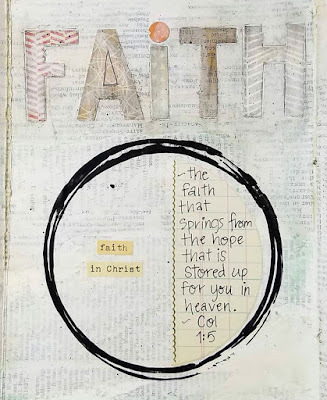 Living faith that is steadfast shows, or proves genuine, our faith in Christ. 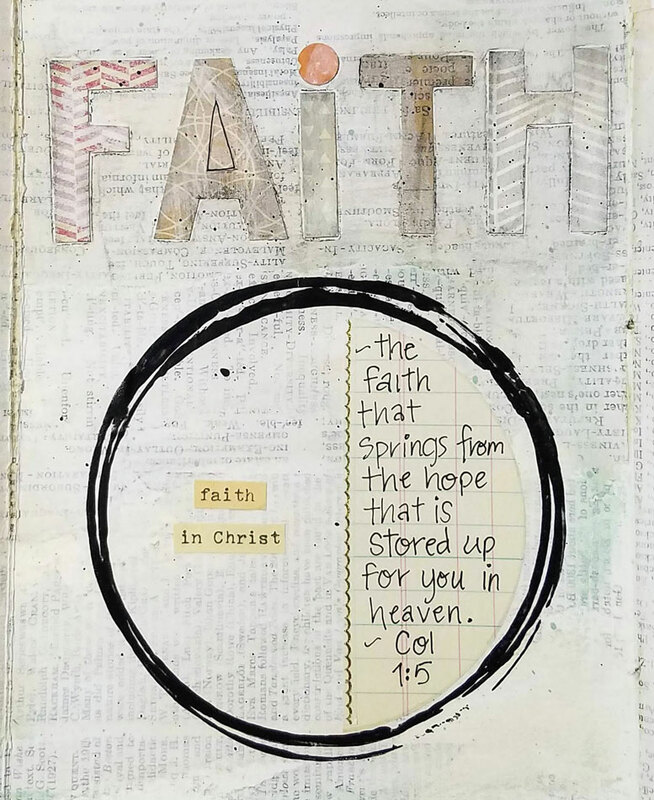 Faith is our mark as Christ followers. 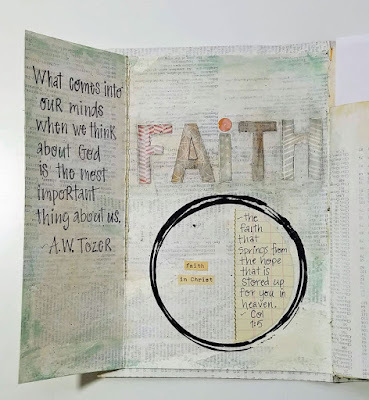 So I think our takeaway today is this: Is our faith visible? 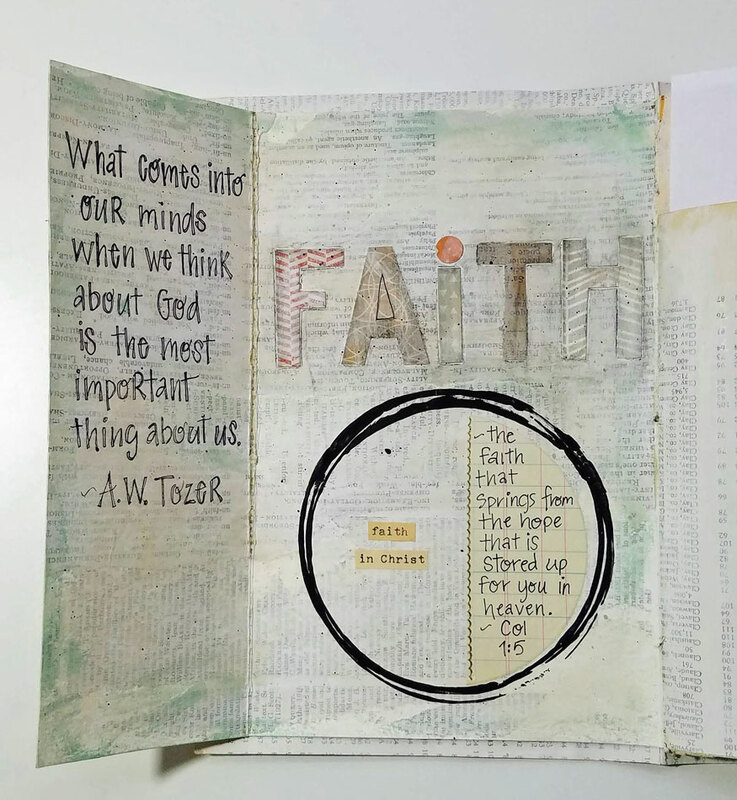 Do our actions prove our faith to be real? Are we sharing our faith stories with others so that they too come to know the saving faith found in Christ? 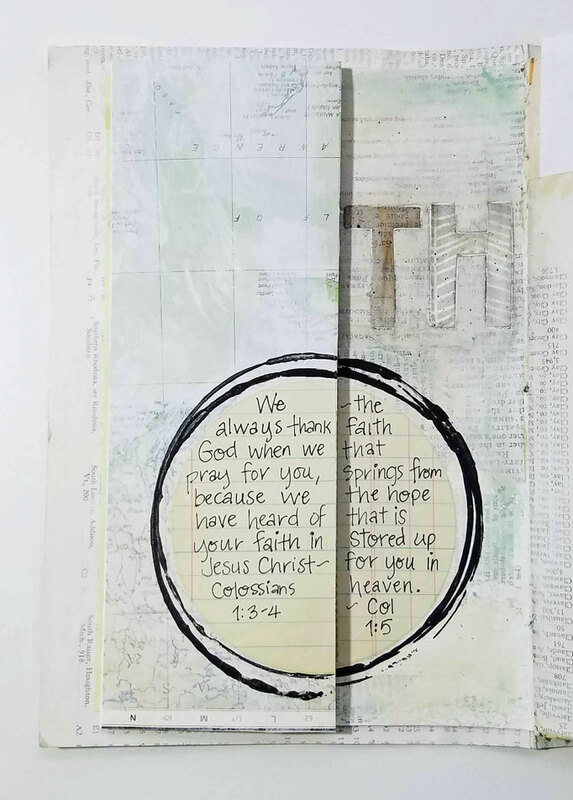 Paul mentions a few people from the Colossian congregation in his letter, holding each of them up as faithful, highlighting their ministry and faithful service to the Lord and to the church - Epaphras (1:7), Tychicus (4:7), and Onesimus (4:9). Is your life a faithful example to others? Are you serving in the ministry of your church, using your gifts and talents to further His kingdom? The word faith/faithful is found in Colossians 9 times: 1:2, 1:4, 1:7, 1:23, 2:5, 2:7, 2:12, 4:7, 4:9. 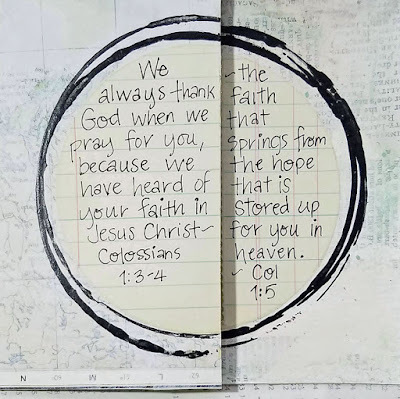 Many English translations also have the word faith in 1:5, however that word does not appear in the Greek translation. 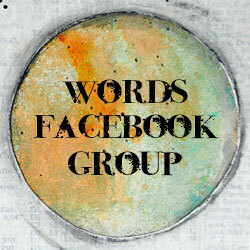 My page: hand cut letters on a scrappy collaged background. 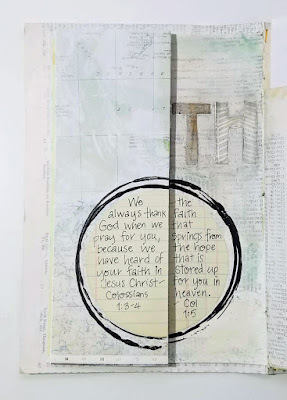 I'm adding typed words to each page to use up all the words I typed for my Colossians Words challenge banner!